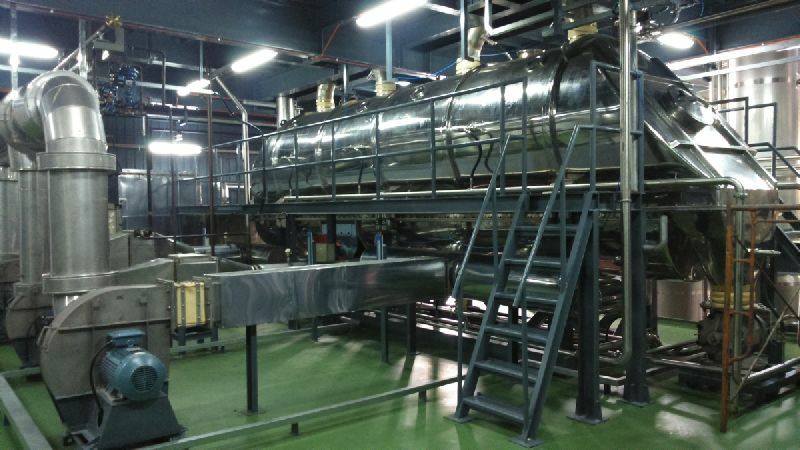 Fluid Bed Dryer / Cooler are widely used in the Industry for gentle drying / cooling of free flowing solids. In fluid bed systems, the material is fluidized with help of air stream using specially designed perforated plate. In addition to this, the fluidizer can also be made vibratory to assist the fluidization by imparting mechanical energy. Drying / Cooling media (Air / Gas) is admitted in the plenum below the perforated plate. Fluidized state enables intensive interaction & of the material & drying / cooling media (air / gas) takes place; hence high rates of heat transfer are achieved. Product residence time can be adjusted through adjustable discharge weir. Product Drying and cooling is possible in single unit. AVM offers Customized Fluid Bed Drying Systems with variety of Configurations. Cyclone Separators – Mono, Twin, Quadruple Cyclones etc. Bag Filters – Reverse Pulsejet, Mechanical Shaking etc. Direct Fired / Indirect Fired Air Heaters : Using Liquid / Gaseous Fuels. Direct / Indirect Fired Air Heaters : Using Solid Fuels, Agro Waste, Saw Dust, Rice Husk, Coal, Briquette etc. Indirect Air Heaters : Using Steam / Hot Oil / Thermic Fluid. Electric Air Heaters : Using electricity. Liquid Spraying System for Product having requirement of Coating / Lecethination. Safety accessories like Rupture Disc, Fire Fighting System. Computerized Control System through PLC/ DCS / SCADA.